The majority of us are not getting adequate magnesium, including many who already take magnesium supplements. There are three reasons for this: the amount of magnesium required by the body is greater than people think; fruits and vegetables have lost mineral content over time due to soil depletion; and some magnesium supplements are poorly absorbed by the body. Magnesium depletion can be caused by a number of stresses on the body, among them lack of adequate dietary magnesium; mental, emotional and environmental stressors; some drugs (diuretics, antibiotics, oral contraceptives, insulin, cortisone); heavy exercise; diabetes; gastrointestinal disorders; and excess calcium in the diet. You can only benefit from trying Natural Calm. As with vitamin C, the body will excrete any excess magnesium. 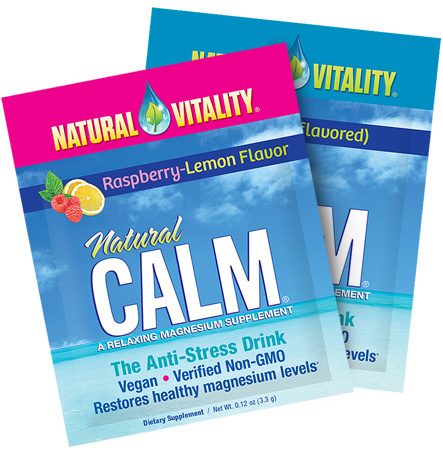 Natural Calm features highly absorbable, water-soluble magnesium in ionic form, so it is ready to go to work right away. Of course, talking about Natural Calm is just talk. The only way to have The CALM Experience is to try it and feel the calm.